Sunday and public holidays: Closed except for first sunday of every month. Saturdays are very busy. This is great and good fun, but if you are just as easily able to come on a weekday, we would recommend that for a calmer visit with more attention. By Bicycle – we are just at the Canada Street entrance of the pink Light Path (te ara i whiti) and easily accessible by the North Western, Nelson Street and Grafton Gully Cycleways. You are welcome to bring your bicycle inside the shop. If it’s your first visit get us to show you how to safely use the bicycle ramp at the entrance! On Foot – we are 100 metres off K Road. Which part of K Road – at the corner with East street, 200m West of St Kevin’s Arcade and Lim Churr supermarket. By Bus – The Red Bus comes up Queen Street to K Road. Get off as soon as the bus gets to K Road and then it’s a 5 minute walk. By Train – Currently the closest stations are Grafton (1.8km walk, flat) or Britomart (2.2km walk uphill or take the red bus to us) or Newmarket (2.7km walk flat or take the innerlink bus). When the City rail link is finished, there will be a train station (Karangahape road) right outside the shop. By Car – While we are right next to the central motorway junction, you’d best use a GPS, as it’s not so obvious which exit to use to arrive and leave. There is ample (metered) parking on Canada Street, even motor homes can easily park here outside lunchtime hours. 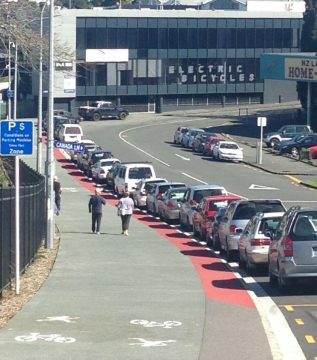 The photo below shows the street at 12pm when parking is mostly all taken by lunch time trade. Outside of 11-1pm it is very easy to get a park. We have 1 off street car park under the building which we can make available by arrangement. Please send us an email regarding when you would like to come so we can make sure it’s clear. When you arrive you’ll need to find somewhere safe to stop and then come in to the store to ask us to come out and open the gate. See the windows that say ELECTRIC BICYCLES? That’s us!